It looks like this weekend is going to be weekend at the movies for all photography lovers. So sit back, and enjoy. Now, the trick is get up once the show is over and try some of the things yourself. After two brilliant videos from Jim Talkington dealing with studio lighting on a budget, comes something completely different. Photographer and DIYer Guy Montag came up with a nice and easy I-have-no-idea-about-electronics way to make high speed photography shots. More chat and the video tutorial after the jump. 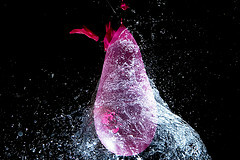 DIYP have some great high speed photography tutorials and some great schemes the electronic wizards can build. But this great high speed photography video does not require anything more then a few inches of aluminum foil and a bit of wire and tape. If you’ll go see Guy’s Flickr stream you’ll realize just how much one can achieve with so little electronics.